As the summer approaches, and everyone is ready to jump in the pool it is important to ready your landscape for your cook outs and family fun. Here at Bloom’s Landcare in Southlake, Texas we have a special way to update your yard for each season as it approaches. We have many different color choices to beautify the pool area in bright summer colors. We help you choose what’s right for your needs and it can even increase your property value. Your lawn or yard is as important to us as it is to you. Our excellent customer service and expertise can turn your landscape into an exquisite garden or tropical paradise. It will wow your guests and neighbors and make your home your own without breaking the bank. Often Texas summers can be tough on many plants and greenery. It can also sometimes be a hassle after long hours of work to perform the kind of intensive care landscape design requires. There are two ways that Bloom’s Landcare in Southlake can help you solve this issue. The first option is installing a sprinkler system in your yard. This ensures that all of your plants, shrubs, and trees are routinely watered without counting on rain or yourself. 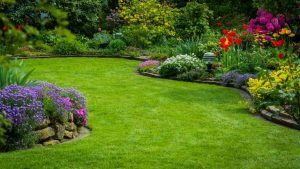 Another option is using several types of shrubbery, grass, and flowers that require little water and care and can survive in poor soil. Some of these plants even thrive in these harsh conditions! We will work with each customer to ensure the right choice is made for their landscape plans. We also offer landscape maintenance to make sure your beautiful yard stays that way. Along with excellent advice we have our own arborists to care for your property. We offer tree trimming, flower bed care, drainage control and many other services at a reasonable price. Let us help you create your vision, and make your Southlake neighbors jealous.